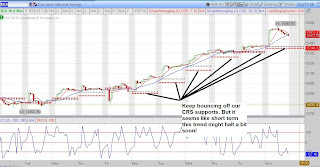 Daniel Loh: 6 days bullish run of the DOW may halt for a while soon?? 6 days bullish run of the DOW may halt for a while soon?? 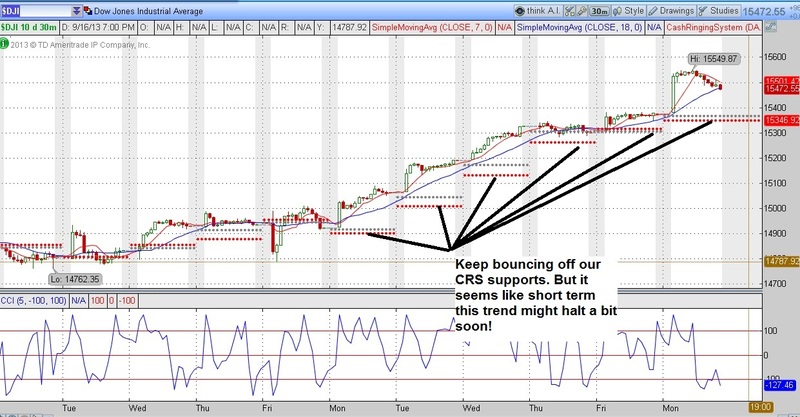 Our proprietary CRS system seems to show that the Dow is bullish and keep bouncing off our CRS supporting lines. But I do believe that this bulllish run might stop a bit soon! Perhaps tomorrow we might see a bit of weakening from the indices these few days. When we say it might halt, I do not mean DOW will surely drop, but just that it might go sideways for a few days. Expectation of a small tapering might have been already factored into this run-up. So it will be normal that the market will be holding back after the announcement by FOMC 2moro. Time to monitor 2moro night's reactions and not advised to act now.